VoIP solutions can help your employees be more productive, save you money, and increase flexibility and adaptability at work, among other benefits to VoIP systems. All that being said, though, there is typically one main concern on a business owner’s mind when it comes to VoIP software: security. It’s a valid concern as you switch over to internet communication or a cloud VoIP, but it shouldn’t be a deterrent. Here at Dutale Inc., we offer VoIP solutions for businesses all over Moreno Valley. We can help you troubleshoot, correct errors, and find the right VoIP solution for you. Our blog is full of information with answers to FAQs about VoIP software, the pros and cons of VoIP systems, how to improve call quality of your VoIP, and more. 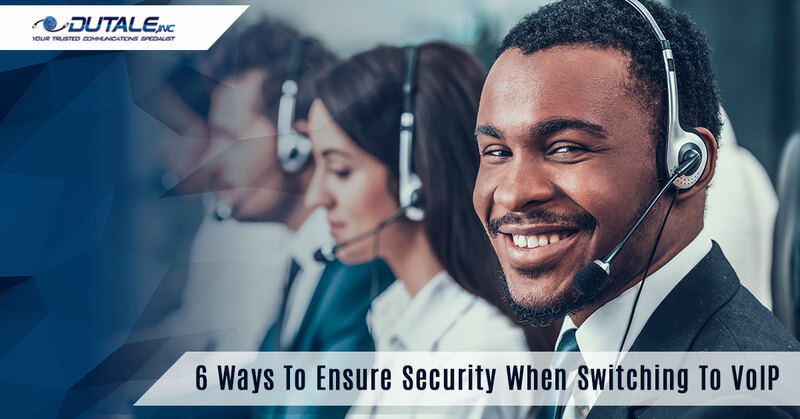 In today’s blog, we’ll cover how you can maximize your security when you make the switch. Read here to learn how, reach out to us with questions, and contact us today for a free quote on VoIP solutions for your business. There are so many things in life that you wouldn’t commit to before doing your research and making sure it was the best option for you, your family, or your business. It’s no different with VoIP software! Check out our tips for choosing a VoIP service or learn more about Star2Star and Zultys VoIP systems, the two VoIP software options we offer at Dutale Inc. Be sure to look into what security options are available with any VoIP solution you look into. If you’ve ever heard of end-to-end encryption, then you’re on the right track. And, frankly, when it comes to modern VoIP systems, there’s no reason not to choose an encrypted option. This means that, from start to finish, all of your business telecommunication will be protected. Keep an eye out for Transport Layer Security (TLS) or Secure Real-Time Transport Protocol (SRTP) encryptions to keep your VoIP communications secure and private. A private VLAN — or virtual LAN — will allow for better segmentation and control of your overall network. When you have a private VLAN, it acts as a single access and uplink point that connects the device to a router, network, or server. It’s a design that is specifically built to ensure your VoIP software protection and eliminate crosstalk and interaction between workstations that shouldn’t be connected. One of the most common attacks that could happen to your cloud VoIP or other VoIP system is known as an account takeover (ATO). Also known as telecom fraud or traffic pumping, and ATO is when a hacker breaks into your system and places calls that cost you, the owner, money. Tracking your usage is going to be one of the best tools of defense here! You’ll notice if there are long phone calls to an unknown location or unreasonable location. If you get a higher-than-usual bill, you can look at your records and track down potential causes — which could include an ATO. Whether you’re a small or a large company in Moreno Valley or Southern California, advocate for yourself after you’ve selected a VoIP solution and vendor! In writing, get explicit security agreements with the vendor. Besides, you’ll never get anything if you don’t ask for it; be upfront from the start and make your expectations known — in writing. When was the last time you changed your email password? What about your login information for your bank? We’ll hazard a guess that it has been longer than it should be. When you have your VoIP system installed and have your new office phone system for small businesses, don’t leave the default password as is! Update it to something that will be less vulnerable, and be sure to update it often. With these six tools in your arsenal, there’s no reason to be hesitant or wary of VoIP software. You can stay protected if you implement these tips, and, as always, Dutale Inc. is here to help when there’s a problem. Reach out to us today about Star2Star or Zultys VoIP software, and request a free quote for VoIP solutions for your business.